A spunky teenaged girl with amnesia realizes that she is a long-lost survivor of the Russian Royal Family. Voiced by Meg Ryan and John Cusack. VIOLENCE/GORE 4 - There is no explicit violence, but there are some scary moments. The villainous Rasputin tries to make Anastasia drink a spooky-looking green potion that will kill her. 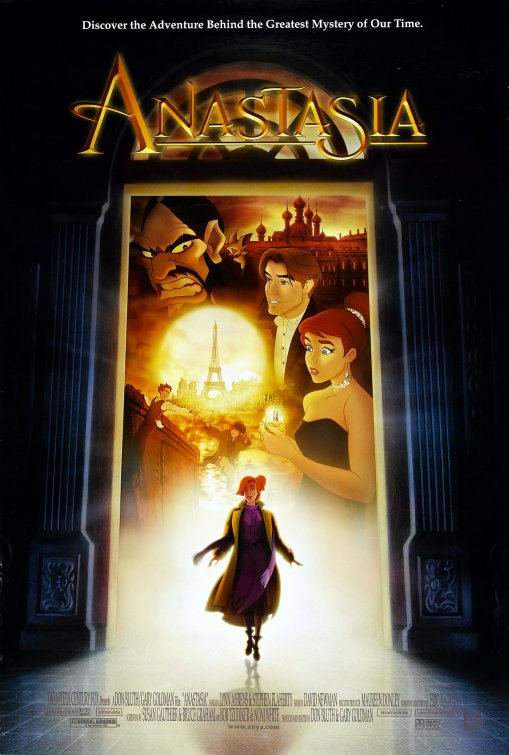 Anastasia and her travelling companion Dimitri almost fall to their deaths from a collapsing bridge. There is a spectacular train wreck. Nearly the entire Russian Royal Family is killed (off-screen), and several frightened people run for their lives. One of the characters is consumed by an evil potion, melts into a gooey mush, turns into a skeleton and then disintegrates. DISCUSSION TOPICS - Amnesia, evil, nobility, Russian history. MESSAGE - Follow your heart, but never forget who you truly are or where you come from.